The photograph above is of Reginald Walker, the South African who won the Olympic 100m in 1908 and equalled the world record of 10.8 seconds. He was only 19 at the time and later in the same year he equalled the world record of 11.4 seconds for the 120 metres. He wrote the first ever textbook on sprinting in 1910. Gissing and McNicol had both run on the Saturday where Gissing had beaten J Soutter in the invitation half mile in 1:56.2 and McNicol had been second in that race before winning heat and final of the open half-mile. Another Monday night supplementary meeting, two more Scottish records. 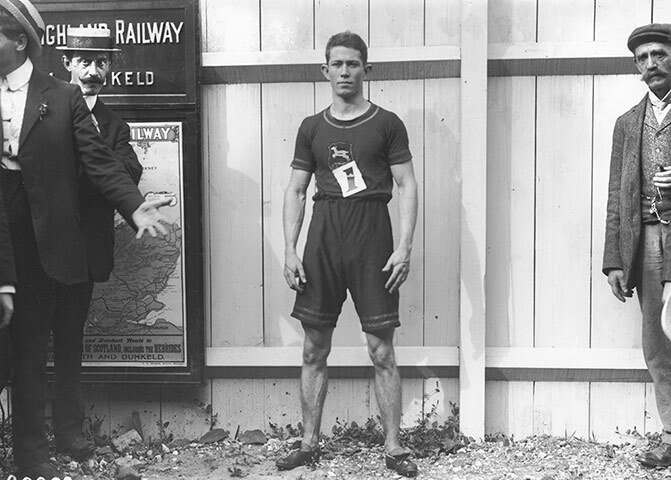 There were foreign stars present at the 1912 sports – H Braun of Germany was out in the half-mile and Hannes Kolehmainen in the Two Miles – as well as the by-now-normal presence of several of the best of English runners as a challenge to the Scots. Braun had won silver (relay) and bronze (880 yards) at the 1908 Olympics and silver in the quarter-mile at the 1912 Olympic Games, so he was a class act to have in Glasgow. Class he may have had but he was unable to catch Sam S Watt of Clydesdale Harriers (45 yards) or E Owen of Broughton Harriers who was second from a mark of 20 yards. 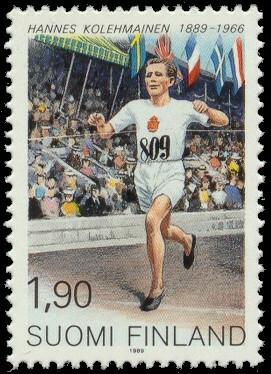 Kolehmainen had won three gold and a silver at the 1912 Olympics (5000m, 10000m, individual cross-country + silver for the team cross-country) and would win the marathon in 1920. Another outstanding talent. He could only finish fourth in the Two Miles invitation handicap which was won by A Craig off a mark of 160 yards. Owen,who finished third, had fallen with two laps to go, got up again, and ran on to defeat the Finnish runner who was times at 9:51 against the record of 9:03.6 set by Shrubb in 1904 It was nevertheless a very good meeting on a cold and wet Monday evening before a crowd of 6000 paying customers. 100 yards handicap: 1. J Cattanach (EUAC – 10y); 2. JM Harper (Shettleston – 10y) 9.9 sec. [Applegarth beaten in the first heat]. 1000 yards invitation: 1. H Baker (NYAC – scr); 2. SS Watt (Clydesdale – 30y); 2 min 16 2-5th sec, new Scottish all-comers’ record. One Mile handicap: 1. AG Hill (Polytechnic – 10y); 2. D McPhee (West of Scotland) 4:23 3-5th. 5-a-side: Clyde beat Rangers by 2 goals and 1 corner, to 2 goals.